From left, Michael Smith, Yves Bradley and Jane Knodell. On Tuesday afternoon, in a basement room at Burlington College, class carried on as usual — students sat listening to their professor, who stood next a life-size skeletal model. Upstairs, the chair of the college's board of trustees was assuring a room full of reporters, students and faculty members that the school's new leadership team would do everything possible to keep the school afloat, despite dire fiscal challenges and the sudden departure of its president. The question for the community, Yves Bradley said, is whether Burlington is better off with or without Burlington college. "We feel extraordinarily strongly that Burlington is better off with Burlington College." Bradley was not being melodramatic. The school is under extreme financial pressure, which led NEASC, the regional accreditation group, to put it on probation earlier this summer. Four days earlier, a group of students precipitated the resignation of the school's president, Christine Plunkett, by protesting outside her car as she attempted to leave a board meeting. On Monday, the board confirmed that Plunkett had left the college. 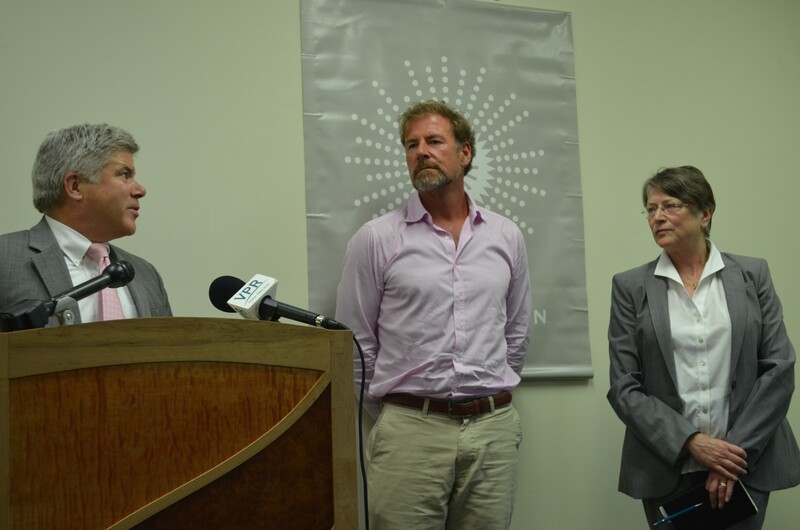 It also announced that former FairPoint Communications state president Michael Smith would serve as interim president alongside Jane Knodell, who will temporarily serve as an academic adviser to Smith, and David Coates, who will act as an interim financial adviser. Smith will be paid $8,000 a month and will work full time through December. Knodell, who will work up to 12 hours a week, and Coates, whose hours haven't been determined, are volunteering their time. On Tuesday, Bradley introduced Smith and Knodell (Coates couldn't attend) at a press conference on campus. The board had no prior warning that Plunkett was going to resign, Bradley said, adding that he believed the president "was pushed to the brink and that she made a decision based on the circumstances occurring around her." On Saturday, Plunkett confirmed to the board that she was, in fact, resigning, which sent them scrambling to find a temporary replacement. Describing the effort as "nothing short of miraculous," Bradley said, "I will not sit here and tell you that Friday was not unsubstantial or inconsequential. That was a blow that could have killed us, believe or not. It's sort of the classic adage of be careful what you wish for because by leaving us without a leader, the perception from our lenders and from NEASC would not have been a good one." The college accumulated $10.5 million in debt, held by the Catholic diocese and People's Bank, after it purchased its lakeside campus in 2010. Bradley said he'd spoken with bank, which views the interim team as a "positive development," but he hasn't spoken with the diocese yet. He would not comment on whether Plunkett was leaving with severance pay. "Why get involved?" WCAX reporter, Keith McGilvery asked Smith. "There are some things that just call you that you have to do," Smith replied. Like Bradley, he urged the greater Burlington community to "step up and really help this institution." The school's value, Smith went on, is that it "serves not only non-traditional students but [also] the students of the community that, but not for Burlington College, would not have a place or an opportunity to go." But everyone who spoke acknowledged that the school's financial challenges are severe and its reputation damaged. "I think we have suffered at the eyes of the general community and that we have a tremendous amount of mending to do of our relationship and the perception of the college in the community," Bradley told the group. The board and the administration will likely also need to do some mending within the school. At least 18 students showed up to Tuesday's press conference. They read a statement at the end of the event that criticized the board for assembling an interim leadership team without consulting the rest of the school. "While we are willing to move forward in working with this group to establish stability, transparency, and trust, we hold tightly to the fact that this is a temporary appointment. We will work with faculty and staff to completely restructure the college to a more horizontal mode of management," the students' statement said. August Cyr, a junior studying film who participated in Friday's protest, piped up during the question-and-answer session for reporters, criticizing Bradley and the rest of the board for refusing to speak with students who had congregated outside their meeting Friday before they confronted the president. "The door was shut in our face," Cyr said. " I don't understand how you weren't expecting something to happen when she walked out." 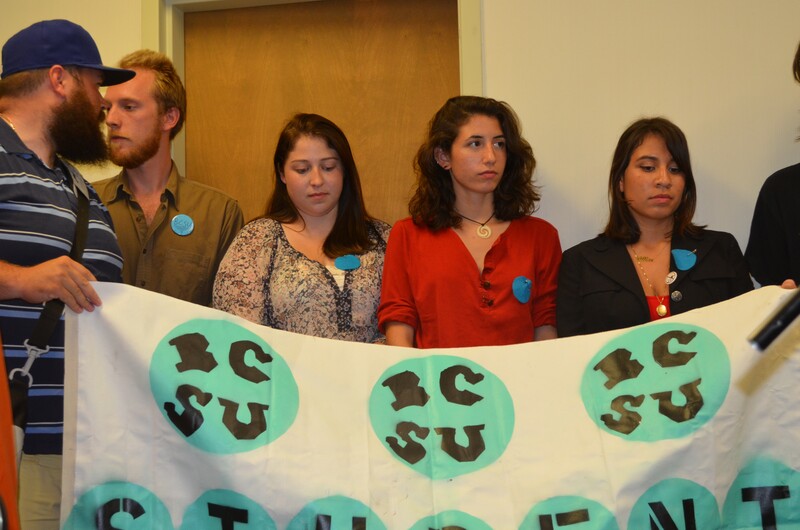 Burlington College students hold a banner at Tuesday's press conference. Referencing the extreme tension between the administration and the rest of the school, Knodell, quoted Abraham Lincoln: "A house divided on itself cannot stand. So to the faculty, the staff and the students: We need to come together." Sandy Baird, a legal professor who is also the the longest-serving faculty member at the college, also attended. "I think that the new leadership team is terrific as far as I can tell," Baird said, giving credit to the students. "I commend the students for all their hard work and for their ability to use their rights of free speech. And I think they will also enjoy working with this new team." The full implications of Plunkett's departure remain unclear. Plunkett planned to sell part of the 32-acre campus to local developer, Eric Farrell, to pay off half the debt. Asked whether the college still planned to sign a development agreement in September, Bradley said the board needed to consult with the interim administration before commenting. The board also revised the 2015 budget last Friday because enrollment numbers — which are still in flux — are lower than anticipated. The college had budgeted for 180 full-time undergraduates. Currently 172 are enrolled, but the board, predicting that additional students may withdraw, is now counting on having 160 students. Asked if the new budget — which hasn't been confirmed by the new administration — included cuts, Bradley said yes.